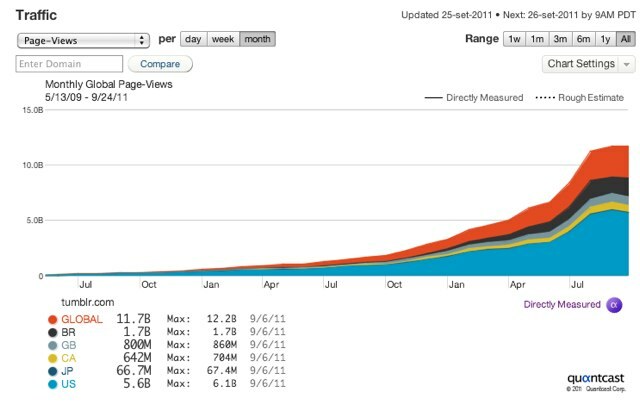 If you are wondering why Tumblr just raised $85 million, all you have to do is look at its pageviews. The super-easy blogging platform saw its pageviews jump from about 2 billion a month to 13 billion since the beginning of the year. It recently passed 10 billion posts, and is adding 40 million more every day. According to Quantcast, which directly measures the site, Tumblr attracts 72 million visitors a month, more than half of those from outside the U.S.
To get a sense of how much of an outlier Tumblr is when it comes to pageviews, let’s take a deeper look at the comScore numbers. (ComScore’s estimates are lower than Quantcasts, but show the same general trends). In August, Tumblr entered the top 100 sites comScore tracks (at No. 99) with an estimated 41 million unique visitors. But it’s estimated 6.5 billion pageviews a month places it at No. 21 among all sites ranked by that metric. By comparison, the Wikimedia Foundation sites (which includes Wikipedia.org) get 423 million unique visitors a month who generate 5.6 billion pageviews.